Case of 100 sterile syringes all individually wrapped for your convenience. The hard-plastic case maintains sterility, which allows you to carry individual syringes without compromising sterility. The latex-free plunger tip moves smoothly inside the polypropylene barrel. Graduated barrel markings help you ensure exact dosage. 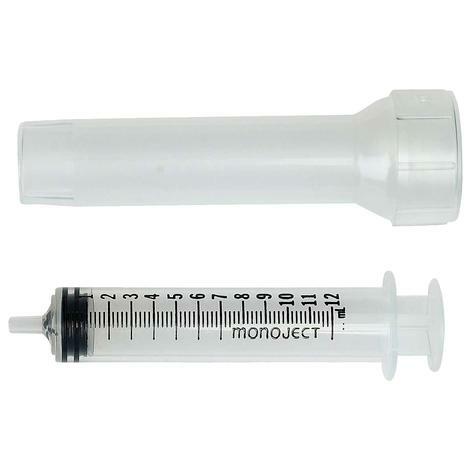 The Luer slip tip makes attaching a needle to this 3cc syringe fast and easy. Case of 50 sterile syringes all individually wrapped for your convenience. The hard-plastic case maintains sterility, which allows you to carry individual syringes without compromising sterility. The latex-free plunger tip moves smoothly inside the polypropylene barrel. Graduated barrel markings help you ensure exact dosage. 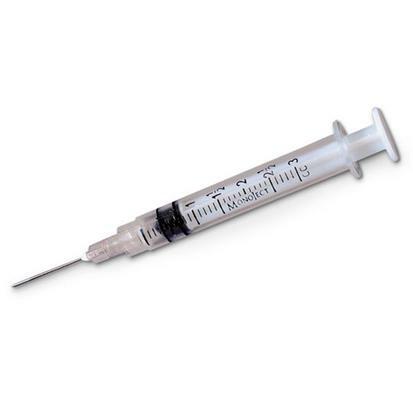 The Luer slip tip makes attaching a needle to this 6cc syringe fast and easy. Case of 100 sterile stainless steel needles with latex free polypropylene hubs. Each needle is individual packaged in a rigid poly hardpack that maintains sterility. They are also autoclavable. These are 16 gauge needles that are 1 inches long. The stainless steel needles are ultra-sharp, tri-beveled, and anti-coring. The easy grip design provides ease of use. Case of 100 sterile stainless steel needles with latex free polypropylene hubs. Each needle is individual packaged in a rigid poly hardpack that maintains sterility. They are also autoclavable. These are 19 gauge needles that are 1 ½ inches long. The stainless steel needles are ultra-sharp, tri-beveled, and anti-coring. The easy grip design provides ease of use. Case of 100 sterile stainless steel needles with latex free polypropylene hubs. Each needle is individual packaged in a rigid poly hardpack that maintains sterility. They are also autoclavable. These are 20 gauge needles that are 1 inches long. The stainless steel needles are ultra-sharp, tri-beveled, and anti-coring. The easy grip design provides ease of use. Case of 100 sterile stainless steel needles with latex free polypropylene hubs. Each needle is individual packaged in a rigid poly hardpack that maintains sterility. They are also autoclavable. These are 20 gauge needles that are 1 ½ inches long. The stainless steel needles are ultra-sharp, tri-beveled, and anti-coring. The easy grip design provides ease of use. Case of 80 sterile syringes all individually wrapped for your convenience. The hard-plastic case maintains sterility, which allows you to carry individual syringes without compromising sterility. The latex-free plunger tip moves smoothly inside the polypropylene barrel. Graduated barrel markings help you ensure exact dosage. 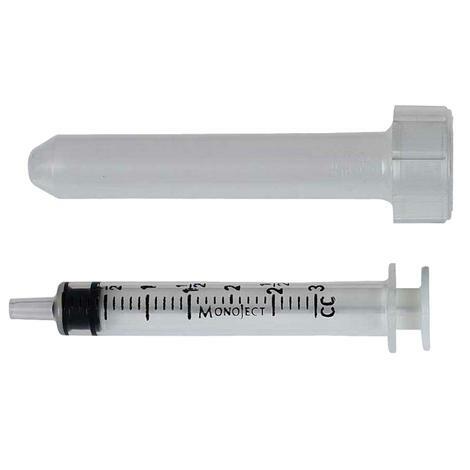 The Luer slip tip makes attaching a needle to this 12cc syringe fast and easy. Case of 100 sterile stainless steel needles with latex free polypropylene hubs. Each needle is individual packaged in a rigid poly hardpack that maintains sterility. They are also autoclavable. These are 18 gauge needles that are 1 ½ inches long. The stainless steel needles are ultra-sharp, tri-beveled, and anti-coring. The easy grip design provides ease of use. 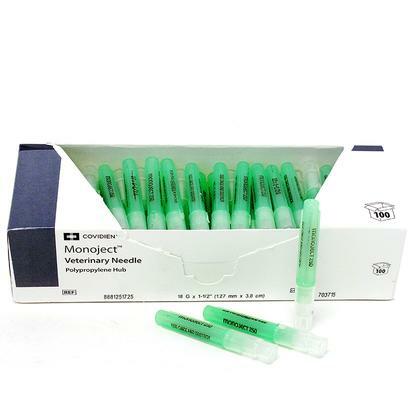 Monoject 60cc regular tip syringe. Single. Case of 20 sterile syringes all individually wrapped for your convenience. The hard-plastic case maintains sterility, which allows you to carry individual syringes without compromising sterility. The latex-free plunger tip moves smoothly inside the polypropylene barrel. Graduated barrel markings help you ensure exact dosage. 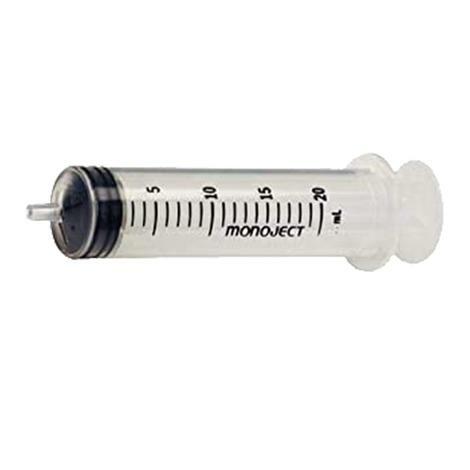 The Luer slip tip makes attaching a needle to this 60cc syringe fast and easy. Case of 30 sterile syringes all individually wrapped for your convenience. The hard-plastic case maintains sterility, which allows you to carry individual syringes without compromising sterility. The latex-free plunger tip moves smoothly inside the polypropylene barrel. Graduated barrel markings help you ensure exact dosage. 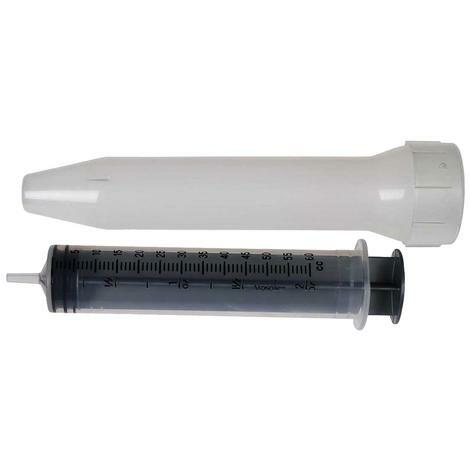 The Luer slip tip makes attaching a needle to this 35cc syringe fast and easy. 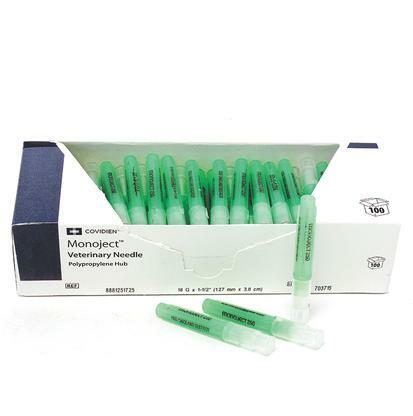 Monoject 3cc regular luer syringe. Single. Case of 100 sterile stainless steel needles with latex free polypropylene hubs. Each needle is individual packaged in a rigid poly hardpack that maintains sterility. They are also autoclavable. These are 14 gauge needles that are 1 ½ inches long. The stainless steel needles are ultra-sharp, tri-beveled, and anti-coring. The easy grip design provides ease of use. Case of 100 sterile stainless steel needles with latex free polypropylene hubs. Each needle is individual packaged in a rigid poly hardpack that maintains sterility. They are also autoclavable. These are 16 gauge needles that are 1 ½ inches long. The stainless steel needles are ultra-sharp, tri-beveled, and anti-coring. The easy grip design provides ease of use. Case of 50 sterile syringes all individually wrapped for your convenience. The hard-plastic case maintains sterility, which allows you to carry individual syringes without compromising sterility. The latex-free plunger tip moves smoothly inside the polypropylene barrel. Graduated barrel markings help you ensure exact dosage. 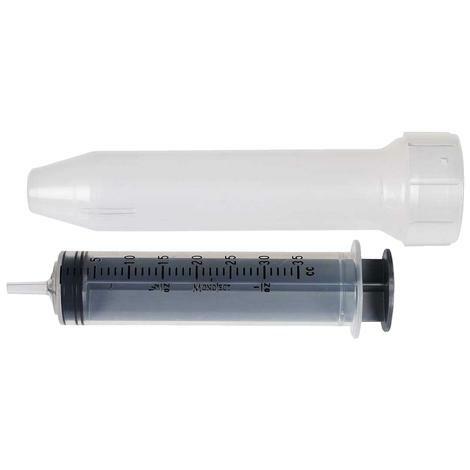 The Luer slip tip makes attaching a needle to this 20cc syringe fast and easy.